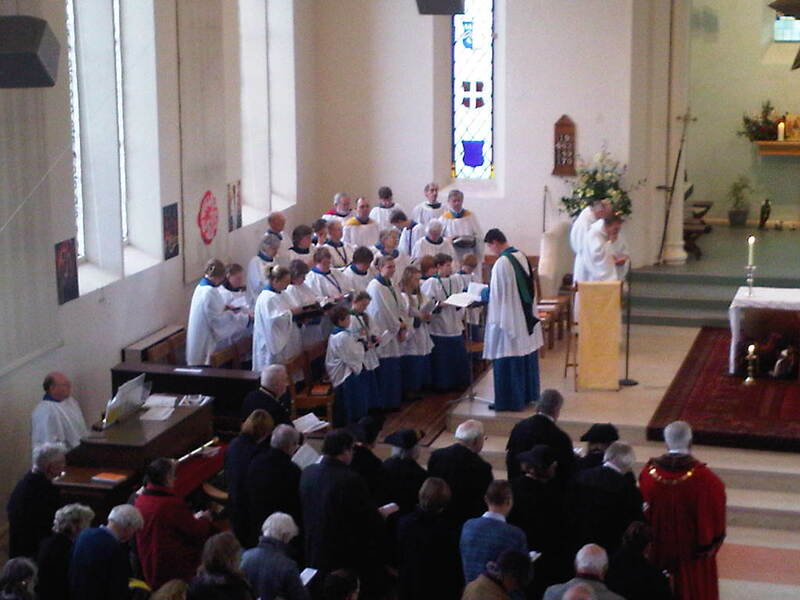 Our superb choir leads us each Sunday and embraces a wide variety of musical traditions. Men, women and children are all most welcome to join us for practice each Thursday, 6.30-8.00pm in church and 9.30-10.00am each Sunday in the Parish Centre. The choir has about 54 members currently on the books. Although on most Sundays throughout the year we average about 30. This means we can sing a full SATB anthem each week. The Director of Music believes in an all-inclusive policy, and everyone can join the choir, and NO audition is necessary. There are normally about 18 children in the choir, some of these have graduated to the back rows. Some go to university, and we welcome them back every holiday to swell our ranks once more. The children used to do the Chichester Diocesan awards scheme – this is now defunct and future chorister exams will be carried out following the RSCM’s Bronze, Silver, and Gold award scheme. There is a lovely social side to the choir, with a yearly BBQ, skittles evening, and frequent Thursday night ‘discussions’ in the local pub. We are very lucky at St Paul’s to have a huge team of talented organists which spreads the workload out. We are currently fund raising for a new electronic organ and we are very proud of our historic Hunter instrument that sits proudly in the gallery. The organists accompany all aspects of the service, and have their voluntary put in the weekly pew sheet for all to see. Every first Sunday of the month Music Group help with our worship. This group runs alongside the choir, and many of its members sing in the choir as well. The group is run by Angela Stephens and concentrates on more modern worship style repertoire, often accompanied by guitar. The Berlin link with the Paul Gerhardt Church, Alt Schoenberg, is something very dear to many existing members of the choir. The link will be 30 years old in 2016, and a piece (based on the words of Bishop Bell and Dietrich Bonhoeffer) has been commissioned to celebrate the strength of this partnership. The last 10 years has seen this link strengthen through the wonderful medium of music in worship. The Chichester Vocal orchestra will always have it’s spiritual home at St Paul’s. It’s director (Chris Larley) is in charge of the music at St Paul’s and Margie Caldicott, a member of the church choir was instrumental in setting this group up. The 30 strong choir of female voices has performed on BBC Radio 4, BBC Songs of Praise, and local radio. Next year it has been invited to sing at a Peace Festival in Bristol, and plans further a field include performing at the Imperial War Museum. For more details please see www.singingtosurvive.com. Throughout the year we hold 4 coffee concerts. These are given by the children, musical members of the congregation, the organists or the Director of Music. These follow the Eucharist on a Sunday morning and are very informal. The choir also takes part in at least two concerts a year. Most notably, it has had the pleasure of performing on stage with Patricia Routledge, raising funds for our new organ. The St Paul’s festival is a biennial celebration which takes place during the last weekend of January around the Feast of the Conversion of St Paul (25th January). The choir also sings the office of evensong. It performs one evensong a year ‘down the road’ in the cathedral!